This evening’s lesson brought my client up to the sixth hour of his Basic Course in Muay Thai for Martial Arts Cross Training. We looked at methods for breaking the clinch and countering after a clinch-break. The horizontal knee was also brought in to finish the section on knee strikes. We began with some dynamic stretching, mobility and callisthenics. Next we moved onto mirror footwork, building up simple combination technique placements. Then we moved onto focus mitts covering basic punch-kick combinations before moving back onto the clinch. The clinch looked at dominating the position as well as breaking away through, over and under the plum hold. I introduced the horizontal knee as a means for creating distance and countering a dominate clinch position. We also looked using the hips to block and blocking the hips in the clinch whilst using effective footwork and angling off. The lesson finished with two rounds of sparring. The first round was clinch-only. 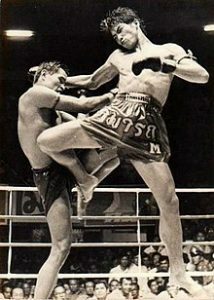 The second was full Muay Thai.